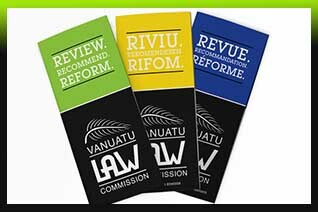 With the establishment of the office in 2012, the office has slowly progressed in bringing more awareness about its role within the Government and to Vanuatu as a whole, and this website is another step in keeping everyone updated on the work and the progress of the current projects that the Law Reform Commission is undertaking. Our main focus is to provide content that will be easily accessible, easy to understand, informative and useful to not only our major stakeholders but also to the public. It is our hope that through this website of ours, everyone will be able to get a better understanding of what law reform is, the process that is followed when reviewing legislations and the important roles that everyone plays in producing a successful outcome. A Ministry or Department who intends to review its laws must consult with the Commission. A Ministry or Department must not instruct a consultant or any other person or authority to review its laws without the prior written approval of the Commission. The VLC team have commenced with their consultation phase for the Juvenile Justice Act and the Adoption Act reviews and will soon carry out consultations in the outer islands which will soon be followed by the report write up of these two reviews.